I was looking for a quick and easy sensory activity to set up for the boys today when I remembered Fun at Home with Kids' Polka Dot Soup. I love how simple and bright it is, but I wondered if my boys would prefer a magnetic version. K really loves to play with the magnet wands so I figured why not make our own version of the polka dot soup by using magnets. 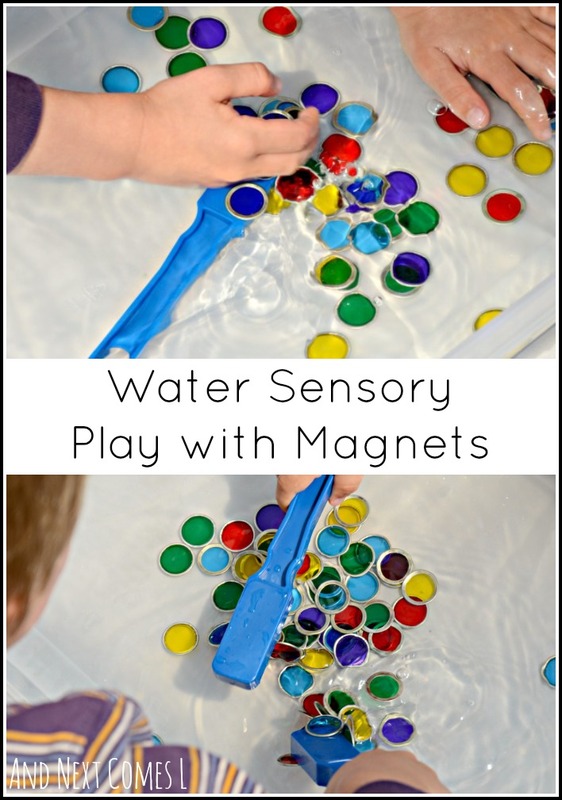 So here's our quick and simple, but oh so colorful and scientifically fun, water sensory bin with magnets! The magnetic transparent counters looked so colorful in the water. Prettiness aside, the boys were definitely more interested in picking up the magnetic transparent counters with the magnet wands. They would call out colors and try to pick up only those colors and sometimes they would count the number of counters that they picked up. Other times they would try to collect all the counters before the other person could. Regardless, it was a whole lot of fun for them! As usual, the boys both eventually climbed into the sensory bin, making this sensory bin a perfect way to cool down on a hot summer day. I love this idea! What a great kids activity. I will definitely try this out with my little girl. Thanks! Hope your daughter enjoys it as much as my boys did! Great combination Dyan! Scheduled to share this afternoon! Where can I get the wand and chips? You can order them from amazon (I've included links in my post). Or, if you have a local teacher's store, then try there. That's where I picked mine up from.